He was a toddler at the outbreak of the Egyptian Revolution of 1952. No wonder he doesn’t recall Muhammad Naguib and military communiqué Number One. He went to school during the years of Gamal Abdel Nasser. In the seventies under Anwar Sadat, he graduated with honors from university and enlisted in the Muslim Brotherhood. Under Hosni Mubarak’s long term in office, he entered both the People’s Assembly and jail. 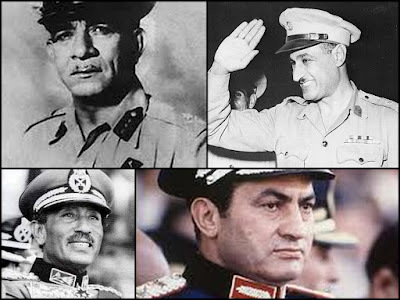 It is thus difficult to compare Egypt’s new president to any of his four predecessors. He didn’t read from the same book or drink from the same spring. He received his PhD (in rocket science) from the University of Southern California and went on to serve as a professor (at California State University in North Ridge). This in no way means Mohamed Mursi is western-educated. Unlike his forerunners, he did not spring from a military academy. He sprang from the (Muslim Brotherhood) General Guide’s gown. We saw yesterday what no one could have imagined a couple of years ago. Mursi himself wouldn’t have dared envisage a dream of such magnitude. No Muslim Brother could have visualized a colleague sitting in Nasser’s chair or Sadat’s rest house or Mubarak’s executive office in Uruba Palace. Mursi was an active and tenacious legislator who anticipated sitting behind bars, not in a palace. You can safely say luck served him well. Angry youths mobilized for change and the Muslim Brotherhood promptly seized the historic opportunity. It had deeper roots and greater means and was better organized than the youths. The revolution simply dropped into its lap. Luck meantime knocked at Mursi’s door. As soon as Khairat el-Shater was disqualified, the Muslim Brotherhood rallied to resolutely back is standby candidate. Good fortune remained on Mursi’s side when Ahmed Shafiq, a former air force commander and the Mubarak regime’s last prime minister, became his opponent in the presidential runoffs. Many voters had to make a bitter choice. Mursi was not the safe bet for a civil state, but Shafiq evoked memories of a forlorn past. The ballot box chose Mursi, leader of the Freedom and Justice Party, as post-revolution president and Egypt donned the Muslim Brotherhood’s robe – but under the military’s watchful eyes. Mursi’s victory is supposed to close the chapter of chicanery, rhetoric and ruthlessness. So exit the pipe dreams and enter the facts and figures. The president-elect now has to think hard of how to revive the ailing economy. He has to reassure investors, tourists, allies and friends. He needs daring, robust and flexible policies coupled with a disposition to compromise. He has to reassure Egypt, which is sharply divided. He has to reassure those in fear of uniform opinion, the uniform dress code and a possible obsolete approach to economic, political, minority and women issues. He must tackle the problems of the constitution, the national assembly and the president’s prerogatives, especially that the Supreme Council of the Armed Forces (SCAF) emasculated the president-elect before he was named. He must ponder Egypt’s regional role, its ties with Israel, the United States and the European Union and mull over the issues of foreign aid, loans and grants and their attached strings. Mursi’s journey won’t be easy. Freezing his Brotherhood membership and proposing to co-opt others won’t suffice. He has to quickly sponsor a serious and comprehensive nationwide reconciliation. The number of voters in his favor shows he won a narrow and conditional mandate. He has to realize his party is henceforth accountable for the people’s demands and aspirations. Dreams are susceptible to cosmetics. Figures are harsh and bare. The days ahead might prove that the Muslim Brotherhood risked a lot when it insisted on winning the presidential palace. On the whole, Egypt revolted, voted and held its breath waiting for the new president’s name. It was a tough exercise in democracy and its anxieties. Egypt went to the polls and chose an Islamist for president, confirming thereby the Arab Spring’s identity as first transpired in Tunisia. It’s not an overstatement to say a changed Egypt is before us. We can also say a changed region is dawning. The Spring that garbed Egypt in a Muslim Brotherhood robe is now drowning in Syria in a sea of funerals and regional and international prizefights. The region is into a season of tremors, surprises and breakdowns. So please fasten your seat belts.